You work hard creating articles, content, and images that will help your reader. When you find someone has used it illegally (meaning without your permission) it can be gut-wrenching. Fortunately, there are things you can do. It happens to all of us. We check our comments to see we received a pingback from another website, just to open it and realize that they’ve stolen our article! You may also be scrolling Pinterest and see your image and click just to see it is now sending users to a different site. As a blogger or content creator, this can be soul crushing. It is your hard work and someone is ripping it off and using it as their own. The first thing to do when this happens is to get angry and upset. That’s expected. Once you’ve calmed down it is important to take the steps to get it removed. HOW DO YOU FIND STOLEN PINS OR CONTENT? HOW MUCH TIME SHOULD I SPEND LOOKING FOR STOLEN CONTENT? How do you find the site’s host? A common question many have is how to find out if this is happening to you. 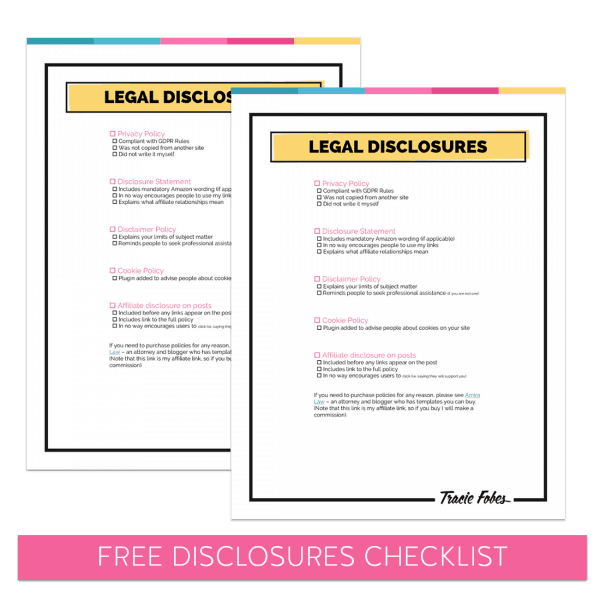 Your content can be stolen a few different ways so you have to know how to find this. There are a couple of ways people steal articles from you. The most common is called scraping. Scraping is when they literally take the article from your site and paste it on their own. Here is an example. Below you see a screenshot of an article from my other site. This article is about how to save money on plane tickets. If you notice the image next to mine, you will see the exact same article is on another site. I don’t own that one. I never gave them permission to use it. They have copied and pasted my entire article – down to my affiliate links – right on their site. So, how did I find this? I used the comment system on my site. Pingbacks. You can (and should) set up your comments to allow pingbacks. A pingback happens when someone uses your content on their site. It could be a link to an article (which is acceptable). It can also include content scrapers. You can see here the pingback showing as a comment that needed approval on the site. When I saw this, I clicked to check their site and noticed it was stolen. I never approve pingbacks. I use them to check for anyone who is trying to use my site in an illegal way. You can easily turn on pingbacks on your site with a couple of clicks. You should do this right away so you can watch for anyone who may be stealing your content through a scraping system. Navigate to Settings > Discussion on your site. Make sure that the second box that allows notifications from other blogs and sites is toggled on – then save your settings. Now you will get an alert in your comment of anyone who is not only linking to you properly but those who may be stealing your content directly from your site. If you find that someone is stealing from you don’t email them. They know what they are doing and will not respond. Not only that, but you do not want them to try to attack you in any way. Skip that and go directly to their host and file a DMCA notice. Pin theft is rampant on Pinterest. 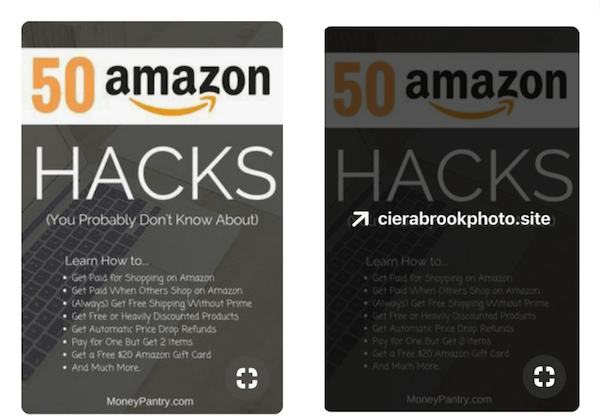 Some bots and thieves sell programs and apps that allow users to use images they do not own and direct them to their spammy sites. Not cool, is it? Pinterest is trying to do things to combat theft such as watching for spammy activity and eliminating the ability to edit the URLs on items you pin. But they’ve got a long way to go. Until this happens you will need to report pins that are stolen. The way you find a stolen pin is that you look at the URL on the image. When you hover on the pin, you will see where the link will take you. If they are different then you know it is stolen. Check this pin. The name on the pin is MoneyPantry.com. But, notice when I hover on the pin, a site that is NOT MoneyPantry.com shows. This is a stolen pin. 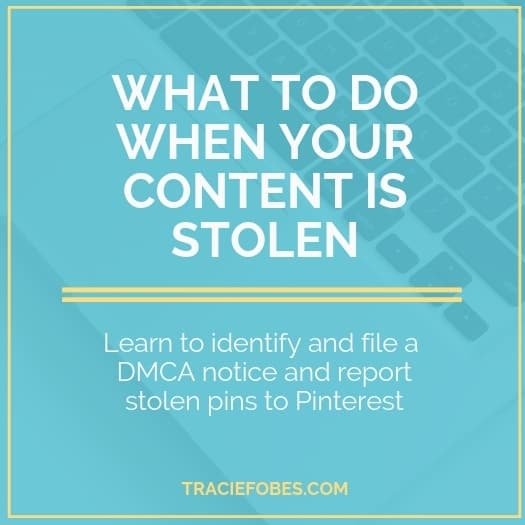 Your content can be stolen in other ways, but these are two ways to identify it before it makes the thief much money. None. You should never go searching anywhere to see if they are stealing from you. I know that sounds crazy, but you need to understand why. When someone steals from you, they take away the time you could be spending writing new content and promoting yourself. That’s bad enough. If you spend 30 minutes every day looking for those stealing from you that is 30 minutes you have wasted worrying about what others are doing. You can’t control what others will do. You can, however, control what you do. Don’t go chasing possible theft. Instead, focus on growing your traffic and income. If you happen to find something stop and report it, but never spend time looking for it. You’ll hear bloggers and site owners talk about DCMA notices when it comes to stolen content. This is how you claim that you own the property and the person using it does not have permission. DMCA stands for Digital Millennium Copyright Act of 1998. It is a US law that protects all digital copyrights, including that of bloggers and content creators. It came about to stop the illegal use of music but covers all digital mediums. When you find your content has been stolen, you will be advised to file a DMCA takedown notice. This is not filed with the owner of the site but instead notifies the platform hosting them that they need to take the content down off of their server. If the hosting company does not take down articles they have were advised it was stolen, they are as guilty as the owner of the site. They too can be guilty. You have to find who hosts the site. This would include companies such as BlueHost, Siteground, and Hostgator, for example. You can use sites such as ICANN WHOIS to find out the host for the site. Type in the name of the site, and they will share the hosting company name with you. Once you know that, you can proceed with filing your DMCA takedown notice. Most hosting companies have a form or procedures to complete to file a DMCA takedown notice. The way you do this differs for every site. Many will have a form to complete, while others will require a letter (see next section for a sample letter). That you are filing the claim in good faith and you are doing so under penalty of perjury that you are filing this accurately and you are the copyright owner. This is a written notice of infringement as in § 512(c) of the U.S. Copyright Law under the Digital Millennium Copyright Act (DMCA). I am hereby filing a report of copyright infringement. The infringing material appears on a website that you host. Type of work — blog post, image, video, etc. URL — link to where the stolen content can be found. As the ower of the content, I have not authorized the use of this content by this site. I hereby swear under penalty of perjury that the information above is accurate and that my content has illegally been infringed. Once you find a stolen pin, you want to report it. Not that if it is not your content, you can’t report it. 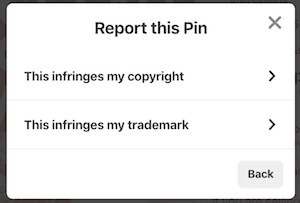 You can only report pins that you own. To report a pin, open the pin to get a larger view. At the top of the page, there are three dots. If you click on this, you will see an option to report a pin. Select that. On the next screen, you will select My Intellectual Property. Because it is your pin, that means it is your content that someone is using illegally. You will then need to indicate if it infringes upon your trademark or copyright or your trademark. For content, it is your copyright (as everything you write is copyrighted on your site). You will see the DMCA notice form to complete. Answer each question truthfully and honestly. 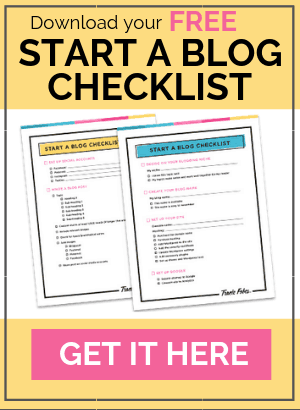 When it comes to letting Pinterest know about the content, you need to make sure you answer this accurately. The top section of the form is your personal data, which is easy to answer. 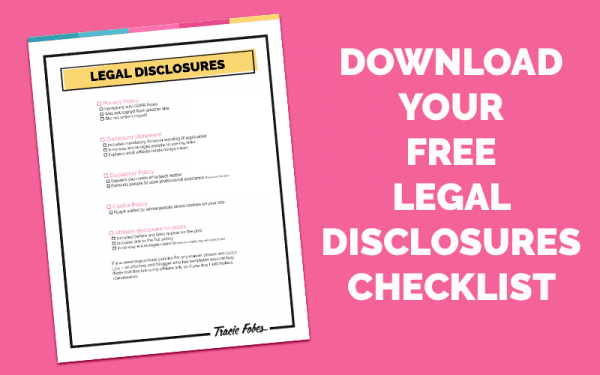 The next sections are those that sometimes confuse bloggers, so we want to make sure you fill it out the right way. You first need to identify YOUR work. This is the original content that is on your site. So you first identify what was stolen. 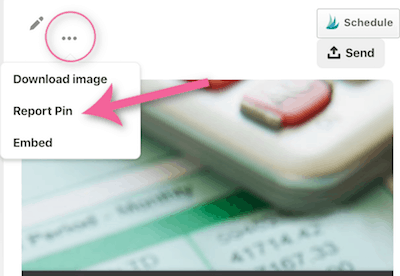 If it is a pin image, then you will select An Image from the drop-down. Next, paste the URL from your site where the original content can be found. That shows Pinterest where it lives so they can see it. Even if it is hidden on the post, it is OK. 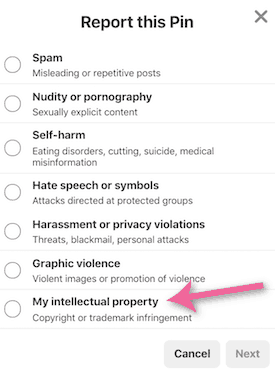 The next section is where you tell Pinterest about the person who stole your content. Paste the Pinterest URL that shows the stolen pin. Then you want to select strike. DO NOT SELECT REMOVE ALL. 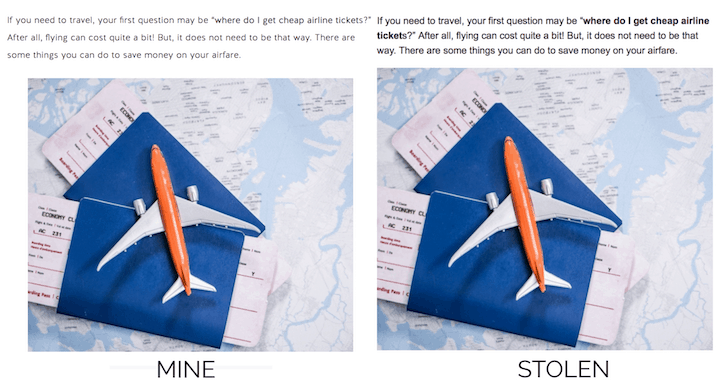 If you click remove all, then it means all instances of that image – including yours – can be removed. You don’t want that. 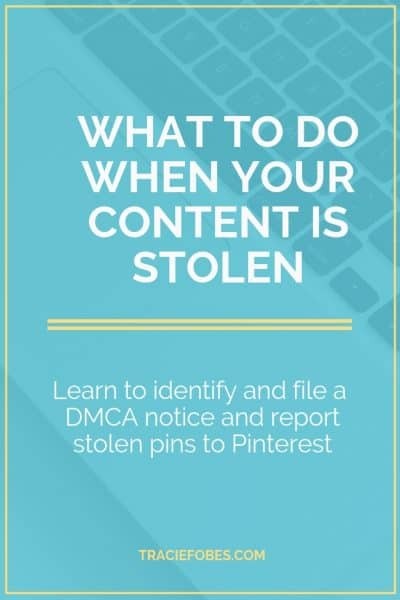 By striking Pinterest will see it is stolen and they will know what to do to ensure that the pin is removed. There are cases where profiles on Pinterest are filled with nothing but stolen pins. That can make it time-consuming to report pin after pin. Pinterest makes it very easy to report an entire account. Navigate to Pinterest Help. Scroll to the very bottom and click on that banner to Sent them A Note. Then expand Report a Policy Violation and select Report Spam. You should then click on A Spammy Pinterest Account. Complete the form with your personal data. Then fill out the form to share the details for the spammy account. Note that Pinterest may ask you to confirm this information when they follow up. They are doing that to make sure that the information is accurate, so they take action and remove the right account (after they do their investigation). Thanks for sharing this out ! I had the same problems before too, but I didn’t know how to react properly. Appreciate for this helpful post!